In February 2017, a trial excavation was conducted along the northwestern fringes of Horbat Bizʽa (North; Permit No. A-7914; map ref. 201939–47/705431–8), prior to the installation of a water pipeline. The excavation, undertaken on behalf of the Israel Antiquities Authority and financed by the Mekorot Company, Ltd., was directed by D. Kirzner (field photography), with the assistance of Y. Amrani and E. Bachar (administration), R. Mishayev (surveying and drafting), P. Gendelman (scientific guidance and ceramics), Y. Gorin-Rosen (glass), R. Kool (numismatics), C. Ben-Ari (GPS), K. Saʽid and M. Massarwa. Horbat Bizʽa extends over a small tell southwest of Kibbutz Maʽanit (Fig. 1). The excavation area was opened northwest of the ruin. Architectural remains and industrial-agricultural installations were documented at the site during the survey of the Map of Maʽanit, yielding pottery sherds ranging in date from the Chalcolithic period to the Ottoman period (Ne’eman 1990: Site 33). 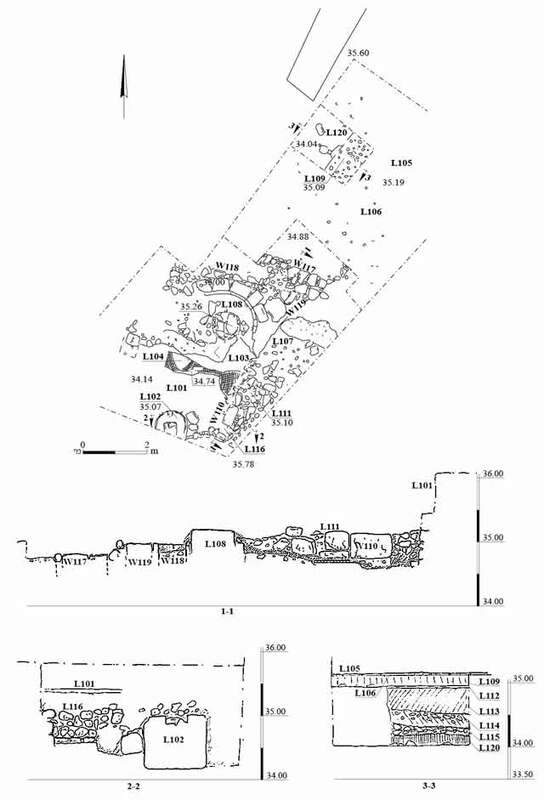 Remains of an extensive industrial-agricultural area from the Roman, Byzantine and the beginning of the Early Islamic periods were discovered in excavations along the northern fringes (Massarwa 2011; Fig. 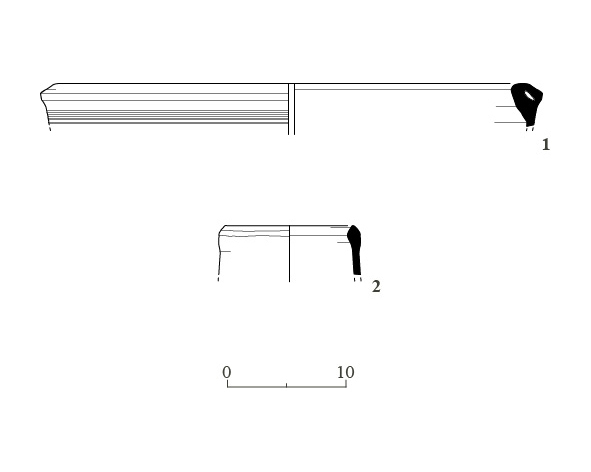 1: A-6334) and the western slope (ʽAd 2012; Fig. 1: A-3283) of Horbat Bizʽa. The excavation area (Fig. 2) had previously sustained damaged due to infrastructure work and cultivation. Prior to the excavation, mechanical equipment removed the topsoil (depth 0.7 m). 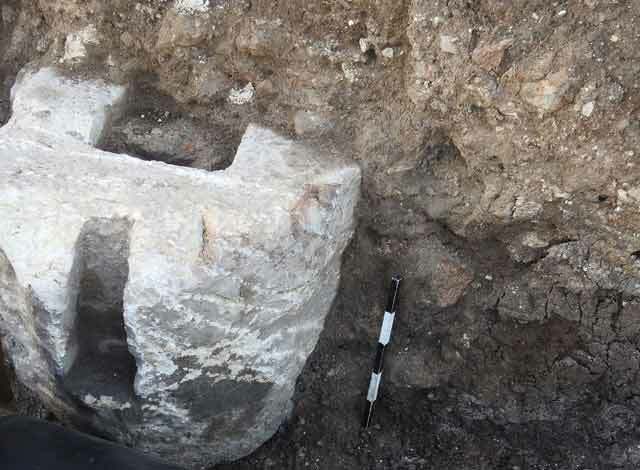 Remains of an olive press, a kiln, work surfaces, plaster floors, walls, pottery sherds, industrial glass waste and coins dating from the Roman period to the Early Islamic period were discovered. A surface of medium and large fieldstones (L120; Fig. 3: Section 3–3) was exposed in a trial square excavated in the northern part of the area; pottery sherds dating from the Roman period (Fig. 4:1, 2) were found on it. Above the fieldstone surface were two layers of brown soil: one of dark brown soil (L115; thickness 0.5 m) from the Late Roman period (Fig. 4:3, 6), and above it a layer of light brown soil containing small fieldstones (L114; thickness 0.2 m) from the Byzantine period (Fig. 4:9, 10), which was probably contemporary with the oil press (below). Overlying these two layers was a layer of red-colored deposit (L113; thickness 0.25 m), which apparently belonged to the kiln (below). The red layer was covered with two floors: one from the Byzantine period (L112; Fig. 4:4) and the other from the Early Islamic period (L109, B1019; Fig. 5). 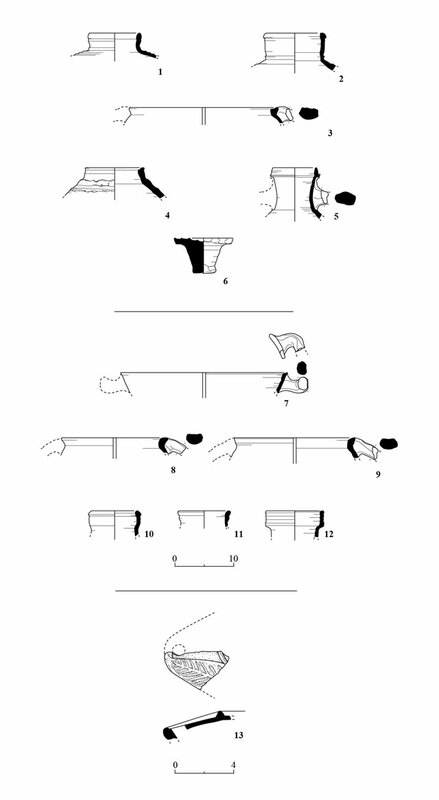 Remains of an olive press were discovered at the southern end of the excavation area: a screw weight (L102; Fig. 6) and, to its north, a section of a white industrial mosaic floor (L104; Fig. 7), whose southern part was destroyed in development work. The floor was delimited on the east by a wall (W110) built of large, hewn stones. South of the wall was a pit (L116) lined with small fieldstones bearing the remains of hydraulic plaster, and to its north was a work surface (L111) paved with medium and large fieldstones. Above the remains of the oil press was a layer of fill (L103) that contained pottery sherds from the Byzantine period (Fig. 4:5). 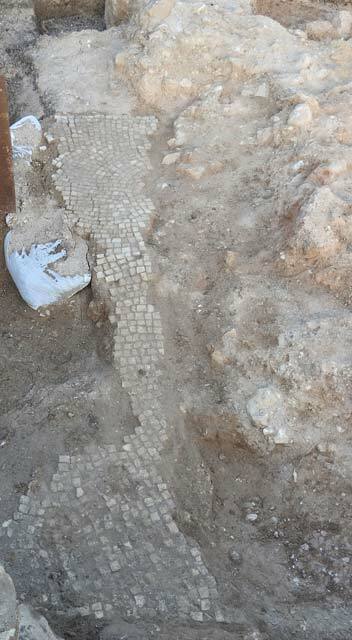 Following the removal of a gray-colored fill (L107) from the northeastern part of the mosaic, remains of a round potter’s kiln (L108; outer diam. 3 m; Fig. 8) from the late Byzantine period were revealed (Fig. 4:11, 12). The kiln was built of large, hewn stones and fired terra-cotta bricks. 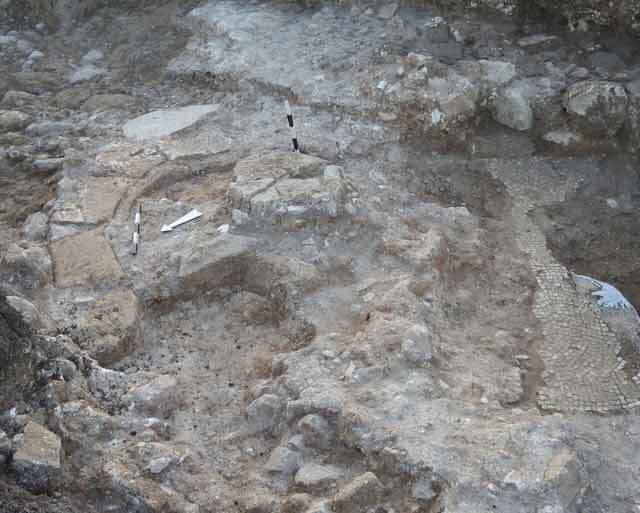 A plaster floor (L105, L106; c. 5 × 5 m) from the Early Islamic period, extended across the northern part of the excavation area, north of kiln. Wall foundations (W117, W119) constructed of large fieldstones were discovered in the center of the excavation area, slightly north of the kiln. No clear connection between them and the kiln or olive press was found. Industrial glass waste, consisting mainly of flakes of clean raw glass and flakes with a layer of kiln debris adhering to them, was found in the excavation, as well as fragments of two vessels from the Byzantine period (not drawn). Remains of industrial glass waste, from both the production of raw material and the manufacture of glassware, were found in a previous excavation at the site (Gorin-Rosen 2012). The excavation also yielded three coins: one from the Roman period (Table 1:1), one from the Byzantine period (Table 1:2), and a third, from the Umayyad period (Table 1:3), which had apparently penetrated into a layer of fill (L103). 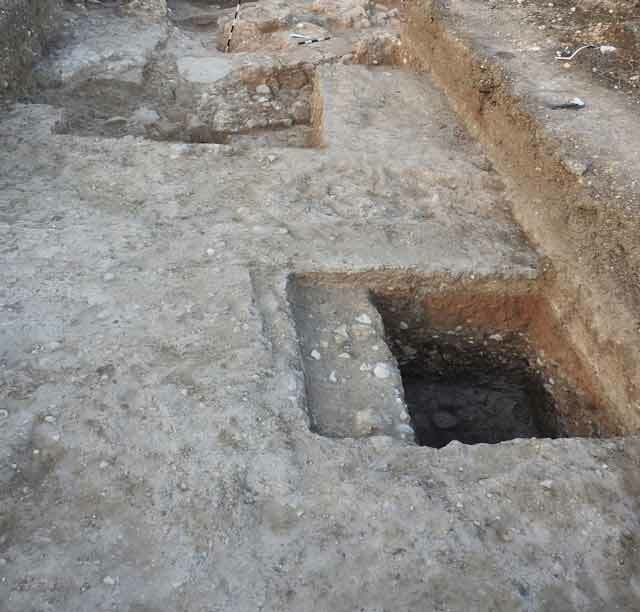 The current excavation revealed an additional part of the industrial-agricultural zone in the northwestern part of Horbat Bizʽa, which is known from previous excavations. ʽAd U. 2012. The Industrial Area of Horbat Bizʽa in the Roman and Byzantine Periods. ʽAtiqot 70:113–122 (Hebrew; English summary, p. 89*). Massarwa A. 2011. Horbat Bizʽa (North). HA-ESI 125. Ne’eman Y. 1990. 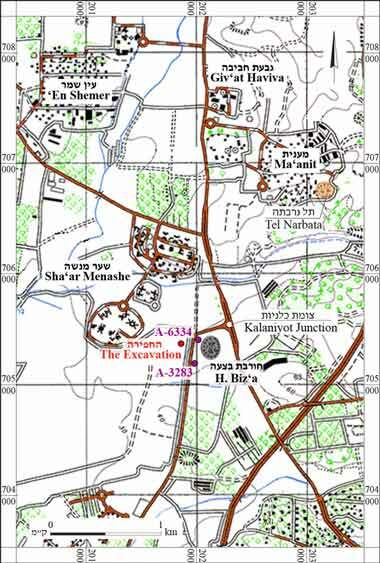 Map of Ma‘anit (54) (Archaeological Survey of Israel). Jerusalem. 4. Pottery from the Roman and Byzantine periods. 5. Pottery from the Early Islamic period. 6. A screw weight of an oil press, looking southwest.